TrueNCOA was created to empower non-profits of all shapes and sizes to reap the benefits of NCOA. Our services help non-profits reduce wasted postage and keep their databases free of old, inaccurate addresses. Watch the video below or continue reading for a step by step guide to processing your first file. 1) Users can navigate to TrueNCOA.com and click the Get Started button. This button redirects the user to the registration page. 2) Users can navigate to http://app.truencoa.com/Users/Register. *** We encourage all users to explore our FAQs on TrueNCOA.com, which have a plethora of information on the NCOA process and getting started with TrueNCOA. 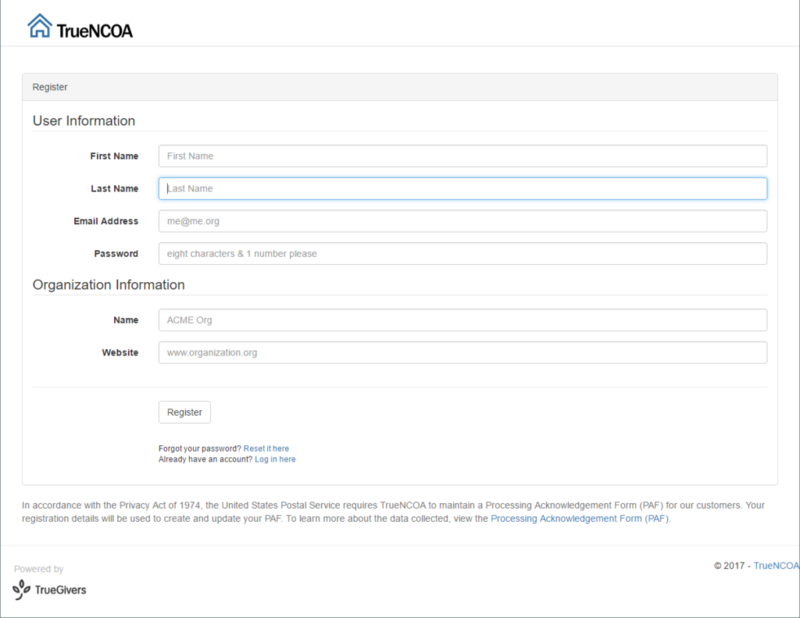 New users must fill out a short Registration Form to access TrueNCOA. This form requires users to enter their First and Last Name, Email Address, a user-created Password, Organization Name, and Organization Website. These fields are used to create your account, and also create and maintain a Processing Acknowledgement Form (PAF). In accordance with the Privacy Act of 1974, the United States Postal Service requires TrueNCOA to maintain a Processing Acknowledgement Form (PAF) for our customers. Your registration details will be used to create and update your PAF. To learn more about the data collected, view a sample Processing Acknowledgement Form (PAF). Once registered, users have full access to app.TrueNCOA.com, and can use their email address (username) and password to sign in again. We process approximately 3,000,000 records per hour, but with quality control and transfer times, an average file of 10,000 records takes about 5 minutes. It's 100% automated, so you can wait until it completes or simply wait for the email when it's done! We encourage users to include as much address related information on their upload file as possible, including: Individual ID, Address ID, Address 2, and Postal Code. Before a user can upload a file, they should ensure that their file is either Comma-Separated Value (CSV) files or Tab Delimited files. A Comma-Separated Value (CSV) File is a simple file format used to store tabular data, such as a spreadsheet or database. A CSV file, as its name states, is created by adding commas to separate the data. 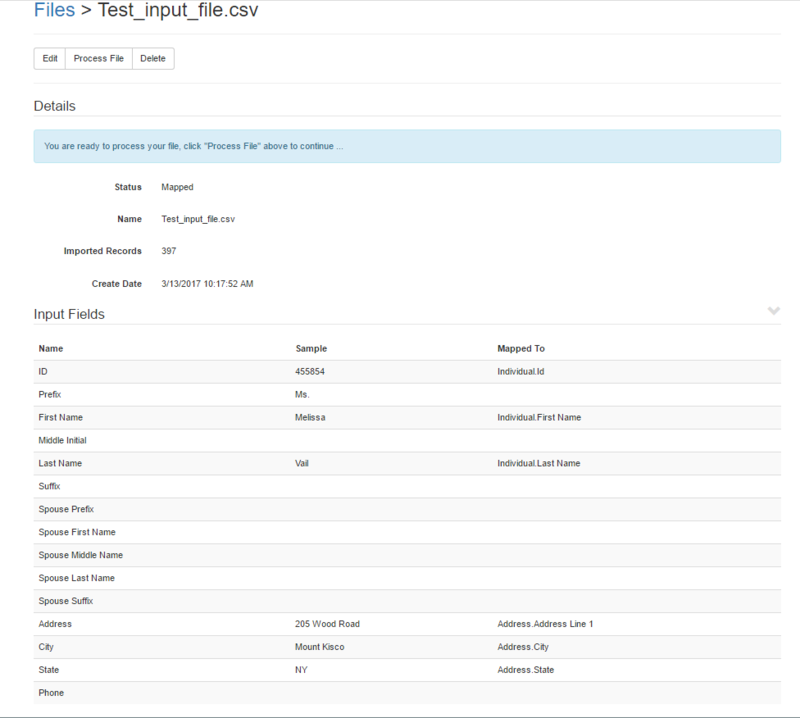 View a sample CSV file. CSV files can be created in Excel by saving the table and changing the 'Save as Type' to CSV (Comma Delimited). A Tab Delimited File is, also, a simple text format for storing data in a tabular structure, such as a spreadsheet or database. This type of file is created by adding tabs between data fields. View a Tab Delimited file. Tab Delimited files can be created in Excel by saving the table and changing the 'Save as Type' to Text (tab delimited). If there is an issue with upload, please contact support@truencoa.com for help. To process your file correctly, TrueNCOA requires users to map their input fields to our system fields. This allows us to read your file correctly and process it. TrueNCOA has an auto-map feature. 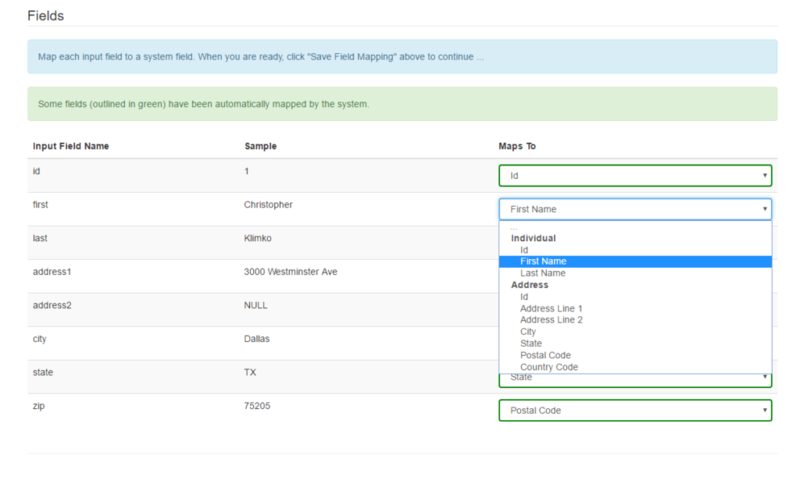 Once you upload your file, if the system recognizes some of your field names, it will automatically be mapped. Users should review mapped fields to confirm their mapping selections. Users can simply click the drop down, and select the system field that matches their input field. This is helpful when all or some of your fields are not automatically mapped. Now, the user can process their file through TrueNCOA! Click Process File located at the top of the page. The file is now being processed with CASS, DPV, RDI, and NCOA. The status of your file is listed on the File Display page and will have a rotating icon until the file is complete. View a Sample TrueNCOA Report. To download a file for the first time, users must have a minimum of 1 credit available. (See the Credits section below for more details). Each initial download costs 1 credit or $20. When ready to download, users can click the 'Download' button located at the top of the screen. After clicking the Download button, users will be asked to confirm that they want to download the file. After confirming the Download request, users will be notified of how many credits they will use. Another prompt will ask users to confirm that they understand 1 Credit will be deducted from their account balance. 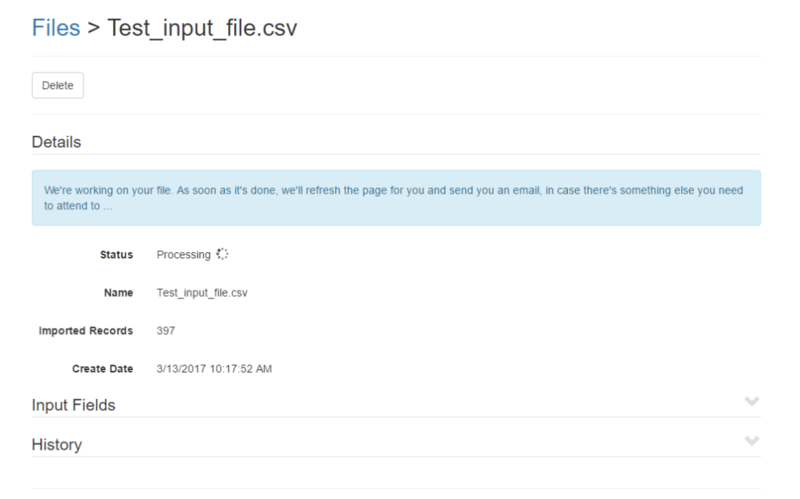 The file will now begin to download to the browser as a CSV file. We recommend users save the downloaded file directly to their computer. Users can re-download a file at any time for FREE. Here at TrueNCOA, we believe that once you pay for something it is yours. TrueNCOA uses a credit system to purchase downloads. 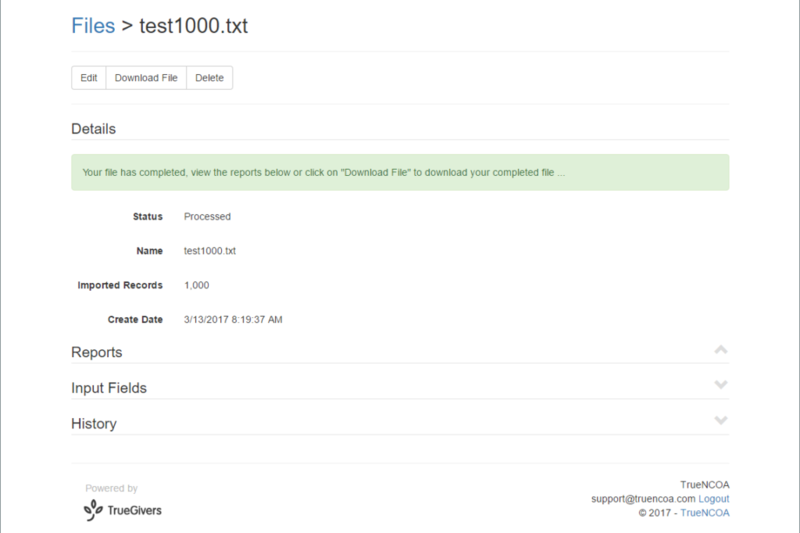 In this system, 1 credit can be used to download a newly processed file. Purchasing credits is quick and easy. 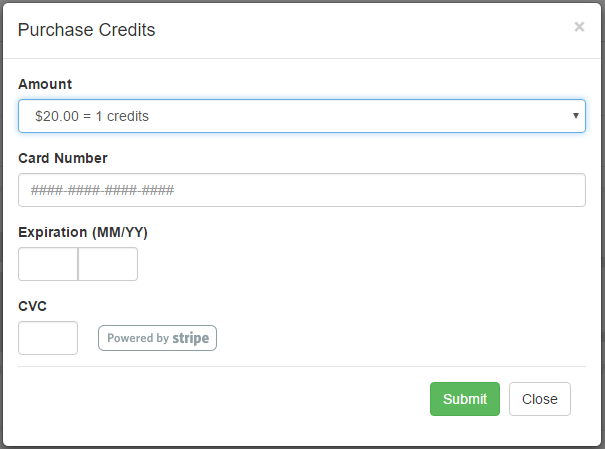 Users can add credits whenever they want and will only be prompted to purchase a credit after they attempt to download a file when their account has zero credits available. TrueNCOA gives users the option to buy 1 credit for $20 or to purchase in bulk. This button will open a payment form. This payment form is powered by Stripe. Stripe uses best-in-class security tools and practices to maintain a high level of security and is a PCI Service Provider Level 1. Our payment form is easy to use and gives users the option to buy 1 credit or 4 credits. These credits do not expire. Once purchased, users will receive a receipt via email and can use their credits immediately. Our credit system is straight forward. Users can by one credit at a time for $20 or purchase in bulk. Downloading a file for the first time will cost the user 1 credit. After this initial download, files can be downloaded again for free. No additional credits will be charged.